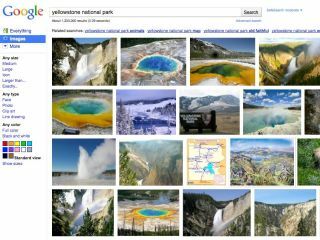 Google Images has undergone a major overhaul bringing in a 'dense tiled layout' along with instant scrolling and larger thumbnail previews . Google images was launched right back in 2001, and according to Google has access to over 10 billion indexed images. "Meanwhile, the quantity and variety of images on the web has ballooned since 2001, and images have become one of the most popular types of content people search for," explained Google Images product manager Nate Smith. "So over the next few days we're rolling out an update to Google Images to match the scope and beauty of this fast-growing visual web, and to bring to the surface some of the powerful technology behind Images." Google explains each of the changes, with the chief design overhaul intended to "get the app out of the way and let you find what you are really looking for". Dense tiled layout designed to make it easy to look at lots of images at once.